Like any Fat Boy, I love biscuits and gravy. I sometimes get tired of the same old thing though, so I decided to try taking biscuits and gravy up a level. 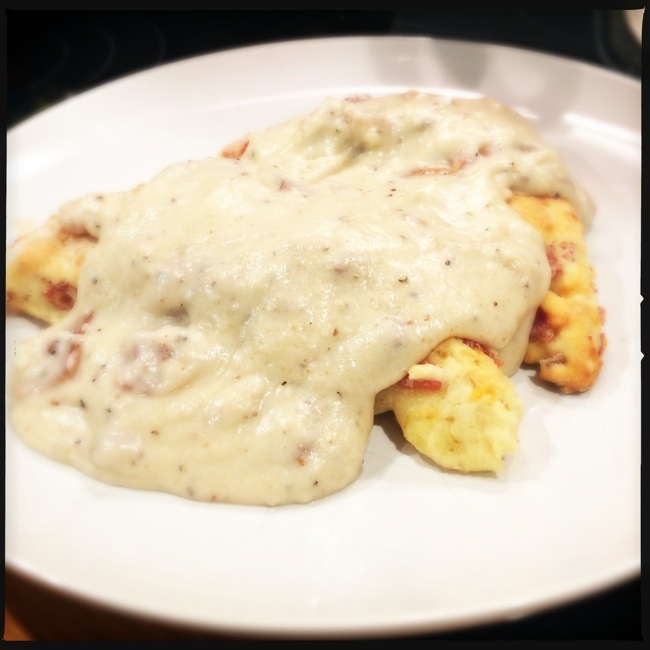 In place of biscuits I went with a savory scone filled with ham and cheddar cheese, and I smothered it in a classic bacon gravy. The scones came out perfectly, with that dense bite you would expect from a good scone, and the addition of ham and cheese with black pepper kicked it up beyond any biscuit you've ever had. The bacon gravy's classic richness paired with the saltiness of the bacon really highlighted the ham of the scone. There are few things that can beat a classic biscuit, but I think this combination is going to be seeing a repeat in our kitchen for a while. Using a pastry cutter, or your fingers, cut in the butter until you have pea-sized pieces that are well combined with the flour mixture. Add the cheese, green onions, ham, and pepper and combine well. Add 1 cup of milk and work just until it becomes a sticky dough, adding more milk as needed, up to 1 1/2 cups. Stop once the dough has come together, do not overwork. Turn out onto a lightly floured surface and pat into a flattened circle, about 3/4-inch thick. Cut into wedges and transfer to a greased or parchmented baking sheet., leaving some space between each wedge. Bake for 15-20 minutes, checking for doneness by busting one open. They are done when they are golden and the inside is flaky. Move to a wire rack to cool briefly then eat away! Add flour to bacon grease, cooking until just browned.